Blending hard science and sci-fi, physicist Del Monte (How to Time Travel, 2013, etc.) 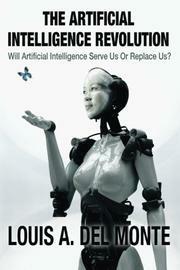 warns of the implications of strong artificial intelligence machines. AI is hardly some far-off invention. We are surrounded by smart technology, from phones to bombs; medical innovations are already turning us into human-machine cyborgs; and computing performance doubles every 18 months. At this rate, as scientists such as Ray Kurzweil have predicted, 2029 may mark the tipping point, or singularity, when machines surpass humans in intelligence. Del Monte offers an accessible history and a realistic future trajectory of SAMs. Automata were imagined by ancient Egyptians and Greeks, and Frankenstein’s monster is but one early example of literature’s preoccupation with intelligent artificial beings, a trend that also included Isaac Asimov’s robot fiction. In 1956, a Dartmouth conference made AI a valid academic subject, soon funded by the Department of Defense. Although machines lack empathy and cannot solve problems based on experiential learning, “affective computing” attempts to teach computers to recognize human emotion through both subjective (gestures and facial features) and objective (blood flow and skin conductivity) means. Still, questions remain: Will SAMs ever exhibit self-awareness? If so, should they be considered a distinct life form with “machine rights” similar to human rights? Del Monte presents three likely scenarios for the future ethics of human-machine interaction: In the worst case, SAMs will exterminate humanity; in the best case, humans will continue to control machines via computers; in the third scenario, somewhere in between those two extremes, humans and cyborgs will cooperate—and possibly intermarry. The book’s well-structured arguments, glossary and lucid prose make it perfectly suited to laymen. Del Monte’s doommongering can seem overblown in places, though: “Time is short because the singularity is approaching with the stealth and agility of a leopard stalking a lamb.” He also tends to repeat his purpose for writing—i.e., “I am ringing the alarm in this book”—and unnecessarily recapitulates his conclusions after each chapter. Moreover, long quotes from other authors overcrowd the author’s own analysis.